It was situated near beach and tram. Nice terrace and it was nice that there was a pool. We have enough space, 70 sq which was nice. Own and free parking place front of the apartment. It was easy to find and luckily there were 3 restaurants quite near though they weren't open late, max 9 p.m. Easy access to the beach and tram. The beach tram was nice experience. The location was excellent. A quiet little beach town but only 1 hour drive from Calais for our ferry the next day. We arrived late but a message and key were left for us so there was no issue with the reception being closed. We stayed in 1 of the studios for New Years for 3 nights. 2 adults and a 12 year old. We absolutely loved everything about this place! Like every single thing! Will defo be going back!!! The apartments were clean, warm and comfortable. They were adequately equipped and it was possible to prepare an easy meal, although we ate out most of the time. The coastal tram and bus were easily accessible and there were a number of places to eat within walking distance. We had 2 dogs with us and most restaurants were very welcoming of them - only 1 refused to allow them in. Also the area was great for exercising them and they loved the beach! Location, proximity to the beach is amazing. Have got a park area for kids, there is pool too. Showers were great. Location of property is excellent. Close to the sea. Pets were allowed. Bed linen was very clean and comfortable. There are interesting places to visit and quite a lot of entertainments. Car can be parked near the property. It was clean and well kept. It was a good location for the beach, amenities and transport links. The room was quite roomy. Option to rent a garage is a plus. 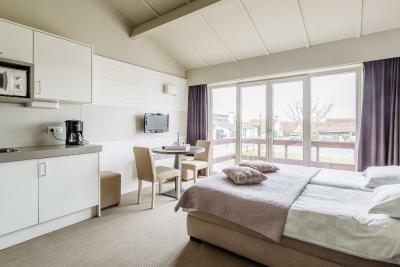 One of our top picks in Middelkerke.Peacefully located in the dunes between Middelkerke and Westende at the North Sea, C-Hotels Zeegalm offers private rooms with a sun terrace, as well as a children's playground and a garden. In July and August, guests can enjoy free access to the outdoor swimming pool. 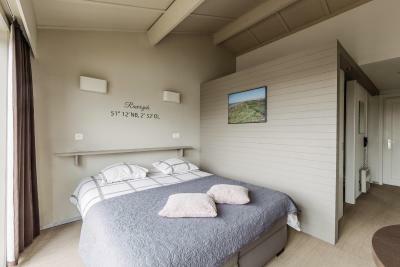 The functional accommodations come with a balcony and a living area with a TV. 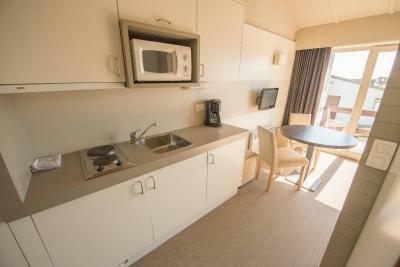 They also feature an equipped kitchenette where guests can prepare meals. The private bathroom is fitted with a bath and/or a shower. At C-Hotels Zeegalm, a buffet-style breakfast is available every morning. The nearest restaurants, bars and cafés are within an easy walking distance. 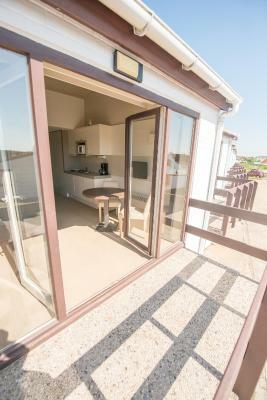 A footpath through the dunes connects C-Hotels Zeegalm to the North Sea Beach in a 5-minute walk. There is a coast tram stop within less than 1,650 feet. From here, you can travel to all the other Belgian seaside resorts as well as Plopsaland Amusement Park. Nieuwpoort is 4.3 mi away. Sights including the North Sea Aquarium and Plopsaland are 30-minutes' drive away. The center of Bruges is 40 minutes away by car. Medieval Bruges is a 30-minute drive away. 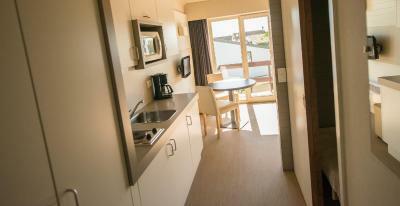 C-Hotels Zeegalm consists of free private parking for bicycles and cars. For a charge, guests can rent a secured garage. When would you like to stay at C-Hotels Zeegalm? 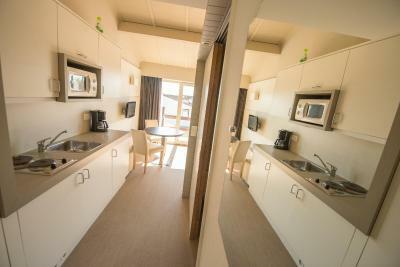 All studios have a seating area, balcony, kitchenette and bathroom. 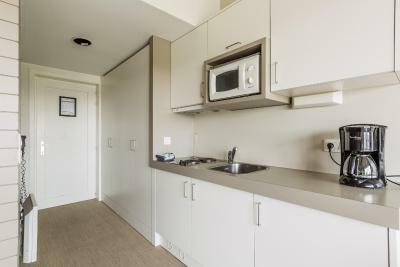 This studio has a microwave and patio. House Rules C-Hotels Zeegalm takes special requests – add in the next step! C-Hotels Zeegalm accepts these cards and reserves the right to temporarily hold an amount prior to arrival. Please note that the reception is closed between 12pm and 2pm. Please note that the reception is closed after 18:00. Guests arriving outside reception opening hours are kindly requested to inform the hotel in advance. Contact details can be found on the booking confirmation. The design of the bathroom was a bit odd. The shower was set in the middle of the bath and was fixed very low on the wall due to the sloping roof - the taller people in our party had a few difficulties! The floor was always wet after showering. However, the water was lovely and hot and the bathroom was clean. Overall we were all very happy with our apartments. No duvet. No kettle. No toilet paper. Bathroom looked in need of some refurbishment; breakfast was good but a bit expensive for the variety it had. Rooms are bit old, ours was an apartment but we found out that studio was more spacious. No air conditioner. No ventilation. Windows are not opening half way. To have air in you have to open it fully and to open the entrance door. It could be challenging to stay if whether is hot. We were lucky to have perfect whether and 20-24 degrees only. Radiators were not clean enough - fat traces were visible. Mold traces were visible in the bath shelves. Refrigerator is very small. WiFi is working only near the balcony - not reachable inside the property. The photos online didn’t show how dated the exterior was. The level of cleanness wasn't good. Shower was in the bath without any curtain etc. so the floor was very wet after shower. People used to walk through our front side (between our car and building where was the bedroom) and they were looking inside our apartment. The pool is not big one and not so clean. It would be nice to have a toaster in the kitchen. The walls are maybe made of paper. You could hear everything what neighbors were discussing or doing. Overall it seems to need an update. The area is rather strange - almost like a ghost town with only very old people around. Note that they do not accept ANY known credit cards (such as Visa and MasterCard) in the restaurants and bars on the promenade. Even the supermarket does not accept these cards so we had to leave all our shopping behind as we couldn’t pay for it! Not for a car and a trailer, very narrow. Apartments look great, not new but in very good condition. The reception was seldom open so it was difficult to drop in if you had a question. It would be great if there were some laundry facilities on size. We visited for four days at the start of b June and it seemed as though the town was abandoned. If you plan to eat out donut early in the evening as it was a ghost town after 9:00. The apartment is cozy and a nice walk to the beach. As a family of four the space was felt a little tight but was manageable. The apartment could have been slightly cleaner..
10 min walk to the beach.. Amenities..